Want to know how to sell your property fast? First off, the best time to sell your home is within the first few weeks of putting it on the market. After this time, potential buyers may consider your house hard to sell and equate that to a fault with the property. For this reason, buyers often disregard old listings completely, which means you won’t be able reach all the people that would normally be interested in your property. Your best bet for getting the highest price for your property is to start your marketing strong and sell fast. One of the top factors in a quick sale is price. Your property needs to be priced correctly; however, this can often be difficult to determine. You may have an ideal price in mind but make sure this is in line with the price of similar properties in the area, so you don’t inadvertently push potential buyers away. Although property prices are often analysed on a yearly basis, prices can change dramatically month-by-month, often with rises and falls in different parts of Australia. 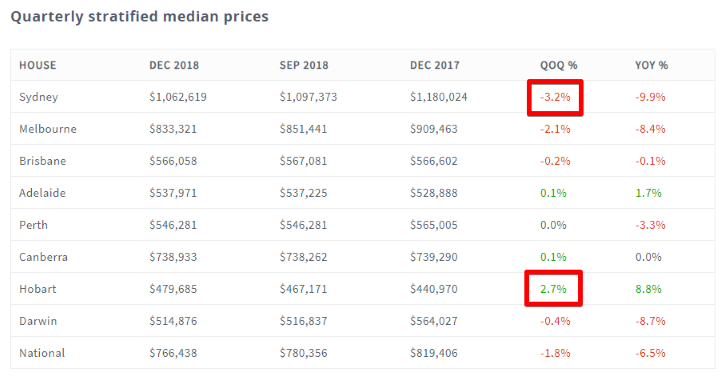 For example, in the Domain 2018 December property price report, Sydney’s house prices plummeted 3.2% in just a three month span, but Hobart’s house prices rose by 2.7%. For a property that was previously $500,000, your property’s ideal price could have lost or gained over $15,000 in just three months. To avoid pricing yourself out of the market, a good place to start is with property reports, which give you an idea of what comparable properties in the area have achieved in price historically. Once you’ve done your own research, local real estate agents can help give you an objective view on the value of your home. Asking for suggested values from a few agents can help ensure your expectations are reasonable for the current market. If you don’t yet have a list of local real estate agents, compare those in your area now with our simple comparison tool. If you need to sell quickly, it may not be possible to wait for the optimal time to sell. However, if you can wait until the right moment, you may sell faster than if you list immediately. Many factors will determine when the time is right for your particular property. Generally, your local area will play a major part in this. If it’s a seller’s market in your area, then you will likely sell faster than if it’s a buyer’s market. Seasons can also play a part in determining when is a good time to put your home on the market. Depending on the month of the year, your property value could vary. A joint study between Swinburne, Griffith and Monash University looked at house prices nationally between 1995 and 2015 and pinpointed the best months to sell. Of most interest is the second period column, which looks at the years after the global financial crisis. Nationally, houses rose in value by around 2% in months outside of Spring. On a $500,000 property, that’s a $10,000 increase in value. Of course, the numbers vary even between suburbs, so it’s best to ask an experienced agent what month or season to sell in, just use our easy comparison tool. Spring is still considered prime time for selling property. This is based on the weather becoming pleasant and people being out and about. It is true that spring is a popular month to sell, but this doesn’t always equate to achieving a quick sale. Spring typically has many more properties listed for sale simply because it’s considered a good season to sell. This means an overabundance of properties for potential buyers to view and, therefore, more competition. If your home is well-presented and well-priced, it may still sell quickly because there are also more potential buyers in the market for a new home. The Australian summer may not be the best time of year to sell, especially for sellers looking to sell their home fast. Summer is typically associated with extreme heat and the holiday season in Australia. The lower competition means that values typically climb a little bit, but properties may be on the market for a little longer as buyers are a little harder to find. Consider the balance between maximising the value of your home and getting a property sold as soon as possible before committing. Autumn can be a great choice for homeowners wanting to sell quickly. As spring is the main focus for prime selling time, autumn is often overlooked. People are usually back at work and ready to start looking for a new home. They’ve also had plenty of time to dream about new year plans over the holidays, which can often include the purchase of a new home. An added bonus in autumn is that the foliage of surrounding trees looks beautiful and can make your home look extra special. Just be sure to keep on top of fallen leaves. The sun hangs lower in the sky in autumn too, which can be helpful in brightening up some properties with natural light. Winter is another season to avoid if you want a quick sale. It’s often cold and dreary and people tend to stay inside more than in the warmer months. As with summer, there will be potential buyers out there but usually not as many as in autumn and spring. Like summer, property values increase (especially in property hubs Sydney and Melbourne) but the property may be listed for a little longer than average. You may get lucky and find the perfect buyer quickly, but chances are your property will be on the market for a little while. To sell a house fast, it needs to be priced correctly, presented well and marketed exceptionally. If you keep these three things in mind, you are setting yourself up to do well from the start. The following top tips should help you achieve a quick sale, especially when timed well for the market and season. If everything goes just right, you may find that these simple, cost-effective tips get you a sale in as quickly as seven days. The first step to preparing any house for the open market is getting it looking presentable. This involves de-cluttering, cleaning and home improvement work. Potential buyers want to see everything nook and cranny in a house before they decide if it’s right for them. By de-cluttering your home, you will strip it back to its essentials and won’t distract potential buyers with unnecessary clutter. Rather than hiding everything in cupboards and wardrobes, consider renting a storage unit. Potential buyers won’t look positively on storage space that is full to the brim with personal items. They’ll likely feel that storage space is lacking and hard to keep organised. Aim to keep only what is necessary during the sales period so buyers can see the true potential of your home. Likewise, remove any family photos or other personal items. The aim is to help potential buyers imagine the home as their own and personal items only distract from this goal. Once you have a clutter-free house, take the opportunity to do a thorough clean. To sell quickly, your house needs to shine and built-up dirt and grime will detract from this. Scrub walls, baseboards, windows and fittings and steam clean carpets to brighten them up as much as possible. If all else fails, a quick coat of paint can work wonders. You may not have much time for repairs and maintenance work if you want to sell your house quickly. However, the more you can do, the better your house will look on open day and the more likely you are to get the right price for your house fast. Once your home is sparkling and functioning well, it’s time to consider staging. A fresh pair of eyes is beneficial for this because you might not be able to see where improvements can be made. The key is to see the property from the eyes of potential buyers on open day. How do you want them to see or feel about the property as they walk through? Co-Principal of Sydney-based Staging Professionals, Janne Petrie quotes a 500% return on investment when staging a home in Australia. That means for an investment of $2000 in home staging, you could receive a $10,000 increase in the value of your property. You can hire a professional stylist to help with staging, but if that’s outside your budget, there are other ways to ensure your home is well-presented when it counts. Ask a friend to walk through and give you tips on what could be improved. Your real estate agent is also a great staging resource and will offer tips based on industry experience. Find your top local real estate agent now, using our free comparison tool. Listings generate initial interest from potential buyers, so you want yours to stand out. Professional photography can make all the difference and need not cost a lot. A friend with a keen eye and some photography experience might do you a favour and take some professional snaps of your property. You could contact a local TAFE or university for students wanting some extra experience. Before choosing a professional photographer, shop around for the best price and make sure you see property-related samples of their work. A survey of agents in Australia found that 99% of real estate agents agreed that quality photographs contributed to increased interest in listings. If photography will be done through your real estate agent, be sure to check that they use a professional who has relevant experience. Curb appeal should be your number one priority when it comes to sprucing up your home. Potential buyers will see your home’s exterior before all else in listings and on open day. An exterior that isn’t well presented can mean the difference between potential buyers choosing to visit your property or deciding to give it a miss. If you are short on time, focusing on the exterior before the interior is your best chance of getting potential buyers there on open day. Of course, do as much as you can on the interior as well but getting your exterior right is essential. After mowing, removing weeds and cutting back foliage, consider how you can quickly improve the appeal of your garden. Refresh mulch, repaint garden edging or add some brightly-coloured plants. Anything you can do to add wow factor to your landscaping is worth considering. A pressure washer is a great option for removing built-up dirt and grime from the outside of your house and the driveway. It’s a fast way to help your exterior shine on open day. Repainting exterior paintwork around windows or on shutters can instantly brighten up your home and make it inspection worthy. Consider repainting the entire exterior of your home if it will dramatically improve first impressions of potential buyers. In the eyes of potential buyers, a well-kept fence is a sure sign that the house will have plenty to offer. Completing any much-needed repairs and brightening up timber fences with a fresh coat of paint is a great place to invest some time and money. Sweep away any cobwebs that could be making your home look uninhabited and be sure to polish anything that can be polished to make even the smallest elements shine. Colour can instantly brighten up your home and make it feel welcoming. Consider adding some colourful flowering plants to entry ways and porches. Some well-placed flowers either side of the driveway can invite potential buyers on open day and give a great first impression. When looking to sell fast, anything you can do to market your own property is a great idea. Sharing your property listing with social groups can sometimes lead to an unexpected sale. However, finding an experienced real estate agent to help market your property can make all the difference when trying to sell quickly. What is the average time it takes you to sell a property? Do you have examples of properties that sold quickly? Are you aware of the pros and cons of the neighbourhood? What is your strategy to achieve a quick sale? Do you list all properties online? If so, on which sites? Are you aware of what potential buyers are looking for at an open house? It’s essential to look at the statistics for any potential agents to ensure they offer a quality service and proven results. Just read our case study with Alan from Sydney, who was stuck with an agent that solely marketed with letterbox leaflets and how we helped him find a much better fit. If you’re looking to sell your property fast, finding a quality real estate agent is an important first step. Your local area will have a range of agents to choose from, each with different experience and skill sets. You can start narrowing down the list with our quick comparison tool and be on your way to a quick sale in no time.